Grab a hot beverage and forget the sleeves! The extra layer on these 12 oz Double Wall Paper Cups lets you promote your brand and skip the sleeves. Ideal for serving virtually any hot beverage. It is also the perfect promotional piece. Our maximum resolution printing and high-quality processes create flawless and fun custom printed cups that stand out. The result: Promotion at its best. Our Double Wall Cups are equipped to hold even the hottest beverages. The cup’s design integrates two separate layers of cardboard with an isolating air gap in-between thereby eliminating the need for sleeves. Without the need for sleeves, our Double Wall Cup saves you cost and storage space. 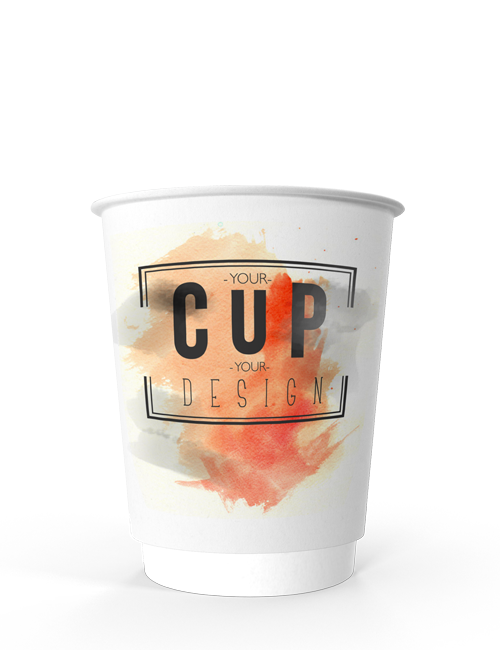 Personalised with your branding, at CupPrint we build our Double Wall Cups to promote your brand effectively at any event, exhibition, conference, restaurant, business, and coffee shop. Our Double Wall Cup is made of top quality paper – the inner wall of the cup is a very rigid 310 gm high-quality boxboard – the outer wall an equally unyielding 300 gm top-notch boxboard. The full colour and process inks we use are all specialised to be food safe and odourless. Plus, our maximum resolution printing ensures that the images on your personalised printed paper cups appear professional, perfect, and the pinnacle of high-quality branding. We offer you many different top-of-the-line processes to make your logo or text unique. Your custom printed Double Wall Cup will truly stand out! We offer a range of order options and competitive pricing. From a 1,000 unit minimum to a 250,000 unit maximum, we are your ideal partner for printed paper cups. Your order will be processed straight away and your custom print paper cups will be delivered to your doorstep within 14 working days! For your individual Double Wall Cup 12 oz design we provide you here our rectangular template as PDF for download.